I love the eco-surf-utopia me and a lot of other artists create, but as I’ve thought more about surfing and why we surf, trips we take, what we think about in the water and how that effects our daily lives I began seeing the balancing act we live by at times. A balance between seeking out the surf utopia when we can through long distance travel or a short recess to our local break, and our daily hectic lives filled with cell phones, advertisements, work, and congestion. More than ever, I think we value the time we have in the water. 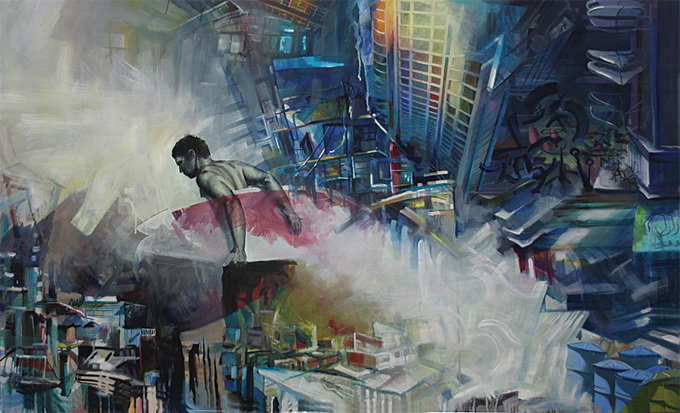 These few paintings for me represent the path the modern surfer must reconcile. Do we continue living as weekend warriors, or can we drop off the grid somewhere near the equator, or can we live with a foot in both pools?